I've spent the past few weeks in my classroom teaching my students about comparative analysis. When I first asked them what compare meant, they wanted to give me pretty simplistic answers. "Compare means look at the pros and cons." "When you compare things you say how they are the same and different." This was a good starting place. They know what compare means, but their answers told me they had never done any serious comparative work. So, I introduced the topic of colleges. "When you start looking at colleges and deciding which ones to apply to what kinds of things will you look at? What will matter to you about the schools you consider?" It only took a few minutes to generate a list that included: location, entrance requirements, cost, size, athletics, available majors, reputation, campus facilities, food, etc. My students agreed that selecting a college is a complicated process that will involve multiple factors, some of which will become more important than others. I used this to show them that comparative analysis is more than just pros and cons and more than just similar and different. Comparative analysis is about looking at a range of criteria to make an evaluation or draw a conclusion. The art teacher invited me to bring my classes down to the school gallery to see the work of some of his advanced art students. This was meant mostly as a casual invitation to come view the art, but when I went to set up our visit, he began telling me about the process his students use for critical feedback. I realized that with a few adjustments that same process could become an exercise in comparative analysis for my students and reinforce some of the literary elements we were working on. See link below to download a copy. 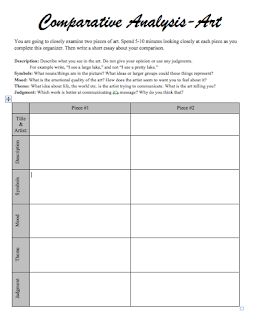 I designed a quick graphic organizer and got ready to take my students to the gallery. I was amazed at how well my students dove into this process. They used their gallery time to silently observe two pieces of art that they chose. They (mostly) took careful notes about what they saw in the artwork. They even asked if they could take some pics of the art to refer to later. This became a great teachable moment for saying, "Yes, you can take a pic for your personal reference, but you can't post it anywhere online because that art belongs to the artist." Lessons in copyright and digital citizenship became authentic and meaningful. 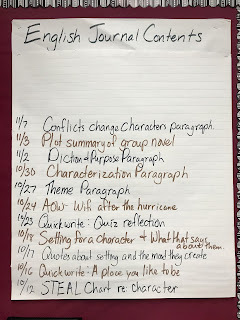 I got a very good sense about what my students do and do not know about comparative writing and I'll apply that insight to our tasks and groupings for the rest of this unit. 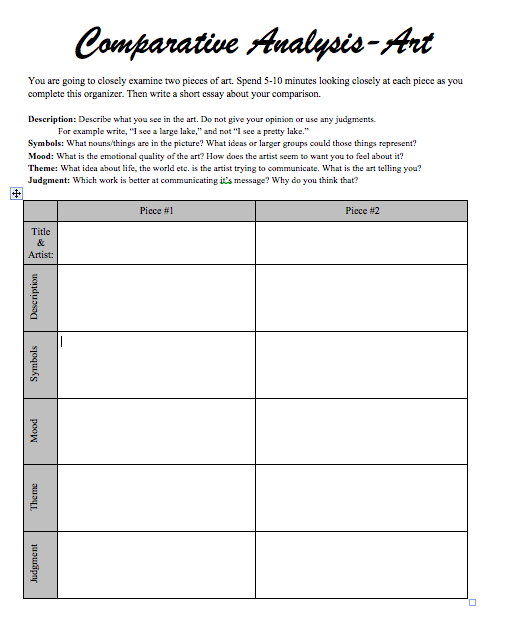 If you'd like a copy of the graphic organizer you can download one HERE. 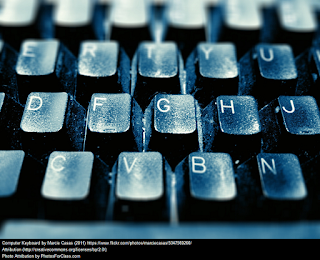 If you usually read this blog for technology enriched teaching it is worth noting that this was a very low tech experience. My students took notes on paper and some even wrote their essays by hand. If you don't have your own student art gallery handy you can use the back up option I gave to my absent students through the Google Cultural Institute, but that will require internet access.